A guide for staff and students at this University to producing wound components. 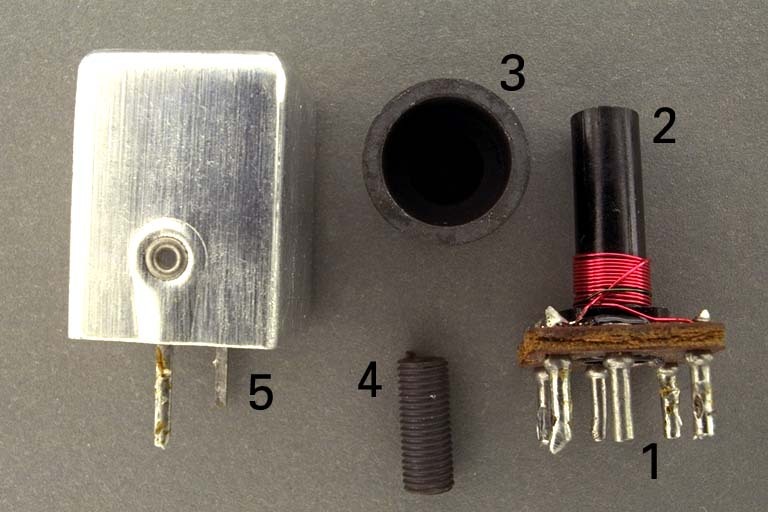 The Teaching Labs hold adjustable (slug tuned) inductance assemblies suitable for low current inductors, transformers and tuned circuits in the range 50kHz to 200MHz. Any inductance between about 1mH and 100 nano-Henry can be produced and also made adjustable by 15% or more. Q factors between 100 and 200 can be achieved. Fix the former into the base using glue (hot-melt is quickest). Apply the windings by hand because there usualy won't be enough turns to justify using the coil winder. Do not wind too close to the top of the former or else the cup will not fit over it. Feed the ends of the wire down the pins in the base and solder the wire to the pin where the wire enters it. Screw the core into the former and then slide the cup over the windings. Lastly fit the screening can over the whole assembly. Your printed circuit board can be drilled according to the pattern below. Last modified: 2002 February 9th.